Sweden's Stilla have returned with a new recording which continues the nature orientated style of black metal from their previous releases and this is a review of their 2018 album "Synviljor" which will be released in November by Nordvis. Keyboards and acoustic guitars start off the album while most of the tracks are very long and epic in length along with some spoken word parts also being heard briefly as well as the riffs also bringing in a great amount of melody and the vocals are mostly grim black metal screams. When the music speeds up a great amount of tremolo picking and blast beats can be heard which also gives the songs more of a raw feeling while the songs also bring in a great mixture of slow, mid paced and fast parts as well as some clean vocals also being added into certain sections of the recording and all of the musical instruments have a very powerful sound to them. Stilla creates another recording that remains true to their nature orientated style of black metal while also utilizing a lot more raw aggression and brutality this time around, the production sounds very professional while the lyrics are written in Swedish and cover the outer limits of the human sensory condition and challenging the boundaries of existence. 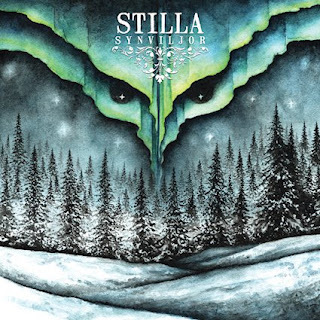 In my opinion this is another great sounding album from Stilla and if you are a fan of atmospheric black metal, you should check out this recording. RECOMMENDED TRACKS INCLUDE "Fralsefrosten" "Myr" and "Ut ur tid och rum". 8 out of 10.